This is an area with a lot of mountains with beautiful volcanoes and landscapes where the color of the typical clothes and the noise of the local business are mixed in an environment of happiness and the coexistence of the people from Panajachel and its surroundings. This is the place where Lake Atitlan is located, which is the most beautiful lake in Guatemala, surrounded by the Atitlan volcano, San Pedro and Toliman. Early in the morning you will go to the high plateau of the country. This is an area with a lot of mountains with beautiful volcanoes and landscapes where the color of the typical clothes and the noise of the local business are mixed in an environment of happiness and the coexistence of the people from Panajachel and its surroundings. 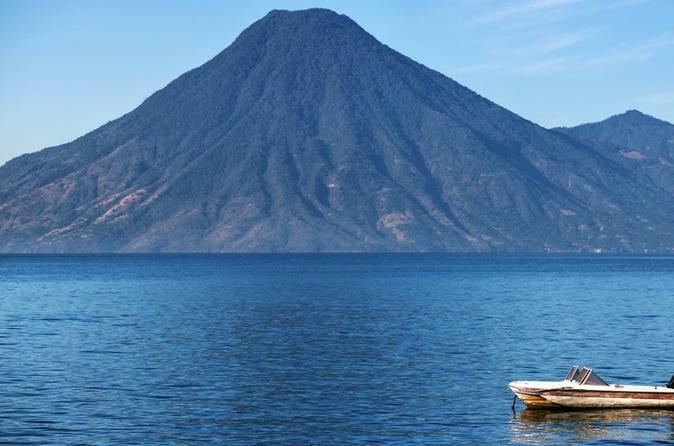 This is the place where Lake Atitlan is located, which is the most beautiful lake in Guatemala, surrounded by the Atitlan volcano, San Pedro and Toliman. Here, a ferry boat will be taken directly to Santiago Atitlán, where the “Cofradía de Maximon” (Maximon´s botherhood) can be seen. In the afternoon you will go back to Panajachel to have lunch and afterwards, you will have time to shop at Santander Street, so that later you can board the vehicle that will take you back to the city, where the one day tour will conclude.